My wife and I are one-percenters. We have amassed a small fortune – built over some 20 years of climbing our respective corporate ladders, saving very aggressively, and making some favorable investments. We worked very hard to build our wealth. But we are also incredibly lucky. We were both winners of what Warren Buffett has dubbed “the uterine lottery”: through no effort on our part, we were both born into safe, stable, American, loving family environments where hard work and academic success were built-in expectations. We were granted this huge headstart in life and had no part in earning it. That early headstart only snowballed as it helped us accumulate advantage upon advantage in our early lives. We benefitted greatly from our society’s investments in all sorts of public goods, public works, and public innovations. More bluntly, because of our unearned headstarts, we benefitted disproportionately as we often extracted more value and more opportunity from these public goods than did our less-advantaged peers. In our youth, we both got into honors-level courses at great public schools. We both had great professors at our public universities, where we both received advanced degrees. In our professional lives, we continued our disproportionate wins, taking greater advantage of public investments in roads, airports, research, computers, the Internet, housing, and police and fire protection. As a business owner, I continue to receive disproportionate share of the benefits from the public investments which deliver customers and vehicles and qualified employees into my shop. My wealth is – in great part – the result of decades of personal hard work, constant learning and creativity, and deep thought. But my wealth is also the product of decades of unearned advantage which allowed me to receive an undeserved greater share of our society’s prosperity. For my disproportionate bounty, I owe a disproportionate debt. This “disproportionate debt” is the basis of the American system of progressive taxation – the reason that those with higher incomes and greater wealth pay taxes at higher rates. The wealthy owe more to the nation which co-produced their wealth. As President Obama’s jobs proposals and the Occupy Wall Street protests have gained favor among independents and an increasing proportion of Republicans, the national conversation has begun to focus on the responsibility of the wealthy in creating, perpetuating, and resolving our current economic woes. In polls, the overwhelming majority of Americans support greater public investments in infrastructure, education, and public safety in order to create jobs. And they support raising historically-low taxes on the wealthiest Americans to do it. And yet, an increasingly-prominent conceit of conservative ideology holds that every person is merely the product of their own singular efforts, and that those with success owe nothing (or owe very little) to the society which made their success possible. Purveyors of this ideology live in a kind of denial – conveniently ignoring the significant roles of simple luck, coupled with public investments in infrastructure, education, and research, in improving their own lives and in enabling the lives of the wealthy. They contend that the wealthy pulled themselves up by their bootstraps, and everyone else should as well. Over the years, I have paid a significant portion of my income to the various federal, state and local jurisdictions in which I have lived, and I deeply resent that President Obama has decided that I don’t need all the money I’ve not paid in taxes over the years, or that I should leave less for my children and grandchildren and give more to him to spend as he thinks fit. I also resent that Warren Buffett and others who have created massive wealth for themselves think I’m “coddled” because they believe they should pay more in taxes. I certainly don’t feel “coddled” because these various governments have not imposed a higher income tax. After all, I did earn it. The corollary to Golub’s “I earned it” meme is that poverty and joblessness are presented less as a result of unfortunate circumstance than they are as a reflection of moral failings on the part of the poor or unemployed. At a book signing in Florida one day later, Cain added that the OWS protesters were un-American and anti-capitalist for protesting against Wall Street banks because “they’re the ones who create jobs” – despite overwhelming evidence to the contrary. At a Republican debate a couple of weeks later, Cain was asked if he stood by his remarks, and his affirmation garnered the night’s biggest applause from the partisan crowd. But perhaps no one in today’s politics defends the rights of the wealthy quite like Wisconsin Congressman Paul Ryan. Ryan, who requires his staff to read Ayn Rand’s Atlas Shrugged for its policy insights, is the chair of the House’s Budget Committee. Ryan is well known – and mystifyingly well-regarded as a “serious thinker” – for his attempts to use the budget process to accelerate social inequality. Ryan’s 2011 budget plan, dubbed The Path to Prosperity, was an audacious reverse-Robin-Hood attempt to slash safety nets for the most vulnerable even as it it further slashed taxes for the already-wealthy. With the President’s jobs agenda and the Wall Street protests gaining popularity, and the national conversation now squarely focused on jobs and inequality, Republicans have been losing control of the political narrative they dominated during this summer’s debt crisis. In a much-anticipated speech, “Saving the American Idea: Rejecting Fear, Envy, and the Politics of Division”, delivered to the conservative Heritage Foundation last week, Ryan attempted to recast that narrative with an ideological agenda nearly worthy of an Ayn Rand protagonist. In that speech, Ryan outlined the American Idea as defined by the “principles of free enterprise, limited government, individual freedom, traditional American values, and a strong national defense”. After chastising the President for promoting his jobs initiatives while “sowing social unrest and class resentment,” Ryan laid out the contours of his new narrative. These actions starkly highlight the difference between the two parties that lies at the heart of the matter: Whether we are a nation that still believes in equality of opportunity, or whether we are moving away from that, and towards an insistence on equality of outcome. If you believe in the former, you follow the American Idea that justice is done when we level the playing field at the starting line, and rewards are proportionate to merit and effort. If you believe in the latter kind of equality, you think most differences in wealth and rewards are matters of luck or exploitation, and that few really deserve what they have. That’s the moral basis of class warfare – a false morality that confuses fairness with redistribution, and promotes class envy instead of social mobility. There are a couple of major problems with Ryan’s new “equality of opportunity” narrative. First, the playing field is never level at the starting line. Unmerited inequalities exist, and they often grow exponentially over time. 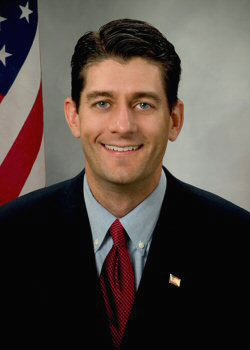 Ryan would have us believe, for instance, that a child born some forty years ago with dark skin to an impoverished single mother in, say, inner-city Detroit had all of the same advantages and opportunities afforded to a child born some forty years ago into a stable, upper-middle-class white family in, say, Janesville, Wisconsin. The circumstances of the starting line matter. And it is all-too-convenient for those given headstarts to pretend they don’t. Second, economic justice doesn’t stop at the starting line. We must also assure that the race is run fairly. Running the race fairly isn’t about insuring “equality of outcome”, as Ryan contends. Most participants will not “win” the economic race. But it is about making certain – through establishment and enforcement of the rules – that participants do not cheat or exploit one another. It is about making certain that we flatten very real hurdles of race, gender, and income (to name just a few). And asking the wealthy to pay disproportionately into the system which helped provide their disproportionate prosperity isn’t “redistribution” – it is merely the repayment of a disproportionate debt. It is fairness. I’m sure that Harvey Golub, Herman Cain, and Paul Ryan all worked incredibly hard to achieve their successes. But somewhere along the way, as they deified their individual efforts and accomplishments, they forgot – if they ever recognized in the first place – the enormous and undeniable roles that luck and public welfare played in their successes. In a town hall two weeks ago, for example, Ryan told a student that the Pell Grant program (federal assistance for lower- and middle-class students) was “unsustainable”, and Ryan noted that he worked three jobs to pay off his student loans. Good for him. But Ryan also leveraged his public school and public university education to get his start in Washington. And while he promoted his private sector student loan as some sort of ideal, Ryan failed to mention that he also used his father’s Social Security death benefits to help pay for college. He went on to a taxpayer-supported career in Washington, including the last 13 years as an employee of the very government he regularly demonizes. With no trace of apparent humility for their remarkable good fortune (nor apparent blush for their remarkable hypocrisy and greed), these successful men promote the mythology of the completely self-made success. But no one with wealth got that wealth solely on the basis of their own virtues. On their paths to success, each got help – sometimes deserved, often not. To ignore the help we have received is to ignore our obligations to one another. Worse, it betrays an unfortunate ungratitude. The wealthy and successful extract greater value (and wealth and success) from our public goods, and thus owe a greater debt to the communities which contributed to their successes. Paul Ryan is right, but inadequate: the American Idea does revolve around rewarding individual merit, effort, and ingenuity. But that isn’t all. That isn’t nearly enough. The American Idea also revolves around our ability to work together to do and build great things. Our civic commitments to greatness – especially in times of crisis – mark our national identity and our national success every bit as much as (maybe even more than) our individuality does. Many of our nation’s greatest accomplishments – Social Security, Interstate highways, successes in World Wars I and II, the Civil Rights Act, National Parks, and even the free enterprise system itself – are built upon a foundation of mutual cooperation and mutual sacrifice. The American Idea is simply not the either-or cartoon presented by Paul Ryan. We are a great nation because of our individual efforts, of which we are justifiably proud. And we are a great nation because of our mutual commitment to one another, of which we are profoundly humbled. We must ensure both to build upon our greatness. That is an American Idea worth saving. One final note: I find it increasingly difficult to tolerate condescending, one-sided lectures on the virtues of individual effort and private enterprise (and on the evils of “redistribution”) when they come from political mercenaries who have financed their professional careers with public money. And, yes, I’m looking at you, Paul Ryan. I agree with some of the sentiment, but the real question is how much? How much of the country should government own and run? Right now, I believe government spending (all levels) is over 40%. At 0% yOu have anarchy and at 100% communism, so I think most Americans agree the right answer for us is somewhere in between. I’m fine with a progressive tax system, but not for the purpose of giving congress ever more of someone else’s money to spend. You have captured the collective ethos, accountability, responcibility and character of being well-born with a social conscience. This isn’t about 1%; this is about .0003% of their impact on education, culture and politics. As long as the current system of mutually aggressive exagerated claims dominate the political spectrum and the publicly stated mission of one is to eliminate governance, not government – while the other’s stated mission is to expand the role of government to safeguard the population from rogue excesses of enterprise, we will be at an impasse. This isn’t the forum to address the impasse, but to recognize others with the resources, sense of responcibility and ethical values and swap experiences. Thanks for helping to draw the line and toeing it without someone to watch over you.